This aluminum pergola kit has one side angled, which works better with the homeowner’s existing stairs and deck. Aakre had to build the pergola taller than usual so it wouldn’t obstruct the windows and so people wouldn’t bump their heads when walking off the existing deck. It provides shade in the afternoons. Aluminum pergola kits run about $6,000-8000 installed. 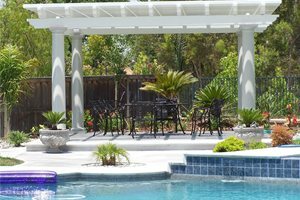 Pergolas are usually custom-built and made of wood, but aluminum and vinyl pergolas are growing in popularity because they last a long time and need almost no maintenance to continue looking good. Since aluminum and vinyl require special tools and techniques to work with, these materials are most commonly available as pre-manufactured kits. 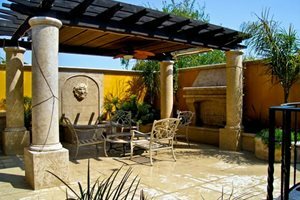 Pergola kits come in pre-determined sizes and shapes, but it’s possible to have some design input in terms of color, detailing, and style of the columns. While there are obvious limitations to choosing a pre-fabricated kit, there are many advantages as well. Aluminum, vinyl, and cellular PVC (from the decking brand Trex) are long-lasting, nearly maintenance-free materials. 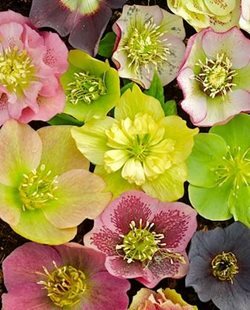 They come colored or painted and the coloration lasts indefinitely, unlike wood which must be sanded and re-stained or painted every few years. Some design elements can be personalized. Ryan Aakre of Signature Landscapes Inc. in Fargo, ND customizes kits for clients by selecting color, adding end scrolls, and choosing the style of column. 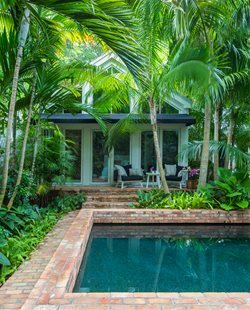 If you don’t want a square or rectangular pergola, Aakre says you can request diagonal or angled corners which fit the surroundings better in a naturalistic landscape. Labor costs are lower to install from a kit because all of the pieces are pre-measured and cut. There are also cost savings over time due to the reduced maintenance. The materials used in kits have a smooth, non-porous surface that doesn’t look natural. 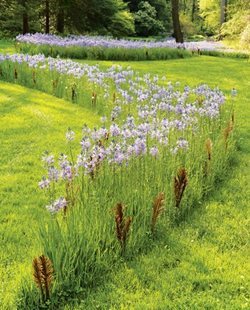 “I’m a purist in terms of materials,” says Alison Terry, a landscape architect and owner of Terry Design in Fullerton, CA. She prefers working with wood and having a local carpenter build pergolas to spec. 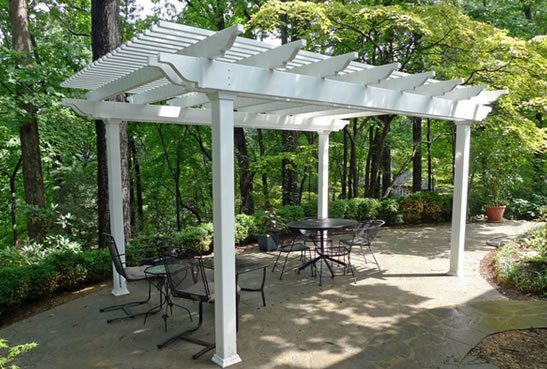 Aluminum and vinyl cost more than wood, so when comparing the overall cost of having a no-frills wooden pergola installed vs. having a kit installed, the kit will usually be higher-priced, even taking into consideration the lower labor costs associated with a kit. This structure was built using a pergola kit from Backyard America. Aluminum pergola kits have been around a little longer than vinyl ones, so many contractors stick with them because they have firsthand experience with the product. Aluminum doesn’t warp, and some brands have variations and graining on the surface which makes it look more natural. There is also a wider variety of colors with aluminum kits, because the aluminum is painted. “They’ve got a good paint system designed to withstand the elements,” says Biedenweg. So unlike wood, you won’t have to repaint aluminum for many years to come. Vinyl pergola kits are newer to the market, so the jury is out on whether they hold up as long as aluminum kits. Vinyl has a shiny, smooth surface that some find appealing and others think looks unnatural. The advantage to vinyl is that the color is integrated into the material itself, so it never needs painting, only washing. However, the downside is that the color selection is smaller in comparison to aluminum kits. Vinyl and aluminum kits are comparable in price. 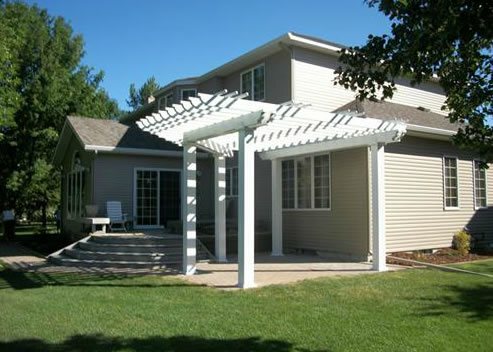 Trex pergola kits are made of cellular PVC with an aluminum core. If you have a deck made of Trex, then a Trex pergola would offer continuity between the different elements of the landscape. They have 12 colors of paint, and the paint job is warrantied for 20 years. Americana Building Products has a variety of aluminum kits in neutral colors. Mt. Hope Fence offers vinyl pergola, arbor, and gazebo kits. Superior Plastic Products specializes in vinyl products such as pergola, arbor, and fencing kits. Trex, known for its recycled decking material, also has a line of ready-to-build pergolas made of cellular PVC.